ST-TFSM-01 Tubular Rope Opener is mainly applicable after rope dyeing. It is used to slit & open roped fabric and has been specially designed for continuous high speed operation in automatic mode. ST-TFSM-01 Tubular Rope Opener is mainly applicable after rope dyeing. It is used to slit & open roped fabric and has been specially designed for continuous high speed operation in automatic mode. The machine material could be A3 Steel or Stainless Steel, which could be suitable for both raw and wet fabrics. Automatic detwister for fabric rope. The signal from feeler is picked up by proximity switches. Fabric rope engagement is by means of rotary opening rollers. distortions, as may be generated by the slitting process. Needle drop sensor can detect the needle drop on the fabric and adjust the basket to place the fabric in proper slitting position. It automatically open the fabric and then centre it, to ensure that the fabric is alignment in the centre of the machine. It is used for both slitting and rope opening function. Controlled by fulid power, 1800mm diameter, for fabric carriage rotation in heavy duty conditions. 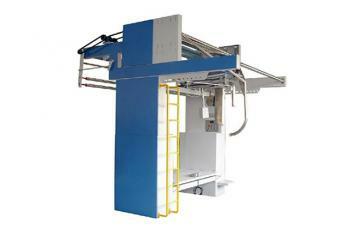 It facilitate the operation of rope detwisting after washing or dyeing. Squeezing unit J-box with an oscillating chute for self adjustment of speed, to be installed on the entry of the line to reduce the quantity of water contained in the fabric.